Elegant, sophisticated and stylish are only a few of the adjectives that appropriately describe this full-floor pre-war apartment. 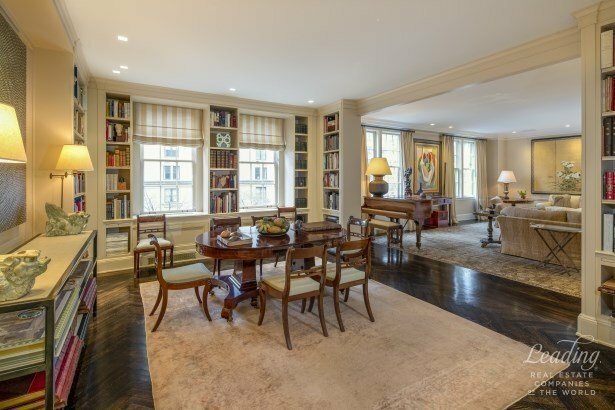 Radiating off the gracious foyer are a beautifully-panelled library, handsome living room, with wood-burning fireplace, which leads to the dining room, all overlooking Park Avenue, and a separate bedroom wing. The private family quarters comprise a capacious corner master bedroom suite with a second wood-burning fireplace and two large additional bedrooms with en-suite bathrooms. The enormous kitchen has a separate family dining area with office. As well, there are a laundry room and a staff room with bath and an ideally-located powder room. Included with the sale are an outside staff room with access to the building's lovely terrace, and exceptionally large storage spaces in the basement. This apartment is in top-notch condition throughout and has a two-zone central air conditioning system. No detail has been overlooked in making this the epitome of comfort and chic. Showings will start the week of February 5th.